This document outlines using the .NET Core SDK and its tools on a build server. The .NET Core toolset works both interactively, where a developer types commands at a command prompt, and automatically, where a Continuous Integration (CI) server runs a build script. The commands, options, inputs, and outputs are the same, and the only things you supply are a way to acquire the tooling and a system to build your app. This document focuses on scenarios of tool acquisition for CI with recommendations on how to design and structure your build scripts. Native installers are available for macOS, Linux, and Windows. The installers require admin (sudo) access to the build server. The advantage of using a native installer is that it installs all of the native dependencies required for the tooling to run. Native installers also provide a system-wide installation of the SDK. macOS users should use the PKG installers. On Linux, there's a choice of using a feed-based package manager, such as apt-get for Ubuntu or yum for CentOS, or using the packages themselves, DEB or RPM. On Windows, use the MSI installer. The latest stable binaries are found at .NET downloads. If you wish to use the latest (and potentially unstable) pre-release tooling, use the links provided at the dotnet/core-sdk GitHub repository. For Linux distributions, tar.gz archives (also known as tarballs) are available; use the installation scripts within the archives to install .NET Core. Using the installer script allows for non-administrative installation on your build server and easy automation for obtaining the tooling. The script takes care of downloading the tooling and extracting it into a default or specified location for use. You can also specify a version of the tooling that you wish to install and whether you want to install the entire SDK or only the shared runtime. The installer script is automated to run at the start of the build to fetch and install the desired version of the SDK. The desired version is whatever version of the SDK your projects require to build. The script allows you to install the SDK in a local directory on the server, run the tools from the installed location, and then clean up (or let the CI service clean up) after the build. This provides encapsulation and isolation to your entire build process. The installation script reference is found in the dotnet-install article. When using the installer script, native dependencies aren't installed automatically. You must install the native dependencies if the operating system doesn't have them. For more information, see Prerequisites for .NET Core on Linux. 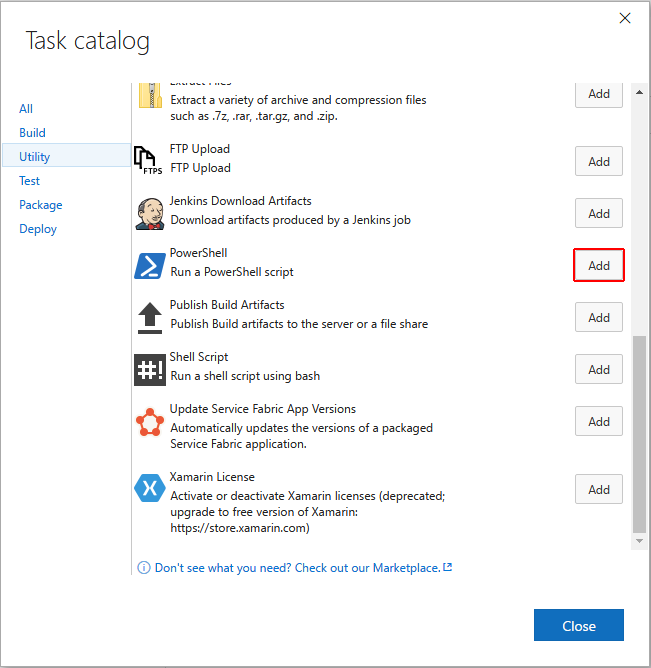 This section describes a manual setup using a PowerShell or bash script, along with a description of several software as a service (SaaS) CI solutions. The SaaS CI solutions covered are Travis CI, AppVeyor, and Azure Pipelines. Each SaaS service has its own methods for creating and configuring a build process. If you use different SaaS solution than those listed or require customization beyond the pre-packaged support, you must perform at least some manual configuration. In general, a manual setup requires you to acquire a version of the tools (or the latest nightly builds of the tools) and run your build script. You can use a PowerShell or bash script to orchestrate the .NET Core commands or use a project file that outlines the build process. The orchestration section provides more detail on these options. You can configure Travis CI to install the .NET Core SDK using the csharp language and the dotnet key. For more information, see the official Travis CI docs on Building a C#, F#, or Visual Basic Project. Note as you access the Travis CI information that the community-maintained language: csharp language identifier works for all .NET languages, including F#, and Mono. Travis CI runs both macOS and Linux jobs in a build matrix, where you specify a combination of runtime, environment, and exclusions/inclusions to cover your build combinations for your app. For more information, see the Customizing the Build article in the Travis CI documentation. The MSBuild-based tools include the LTS (1.0.x) and Current (1.1.x) runtimes in the package; so by installing the SDK, you receive everything you need to build. AppVeyor installs the .NET Core 1.0.1 SDK with the Visual Studio 2017 build worker image. Other build images with different versions of the .NET Core SDK are available. For more information, see the appveyor.yml example and the Build worker images article in the AppVeyor docs. Run the script from the manual setup step using your commands. Create a build composed of several Azure DevOps Services built-in build tasks that are configured to use .NET Core tools. Both solutions are valid. Using a manual setup script, you control the version of the tools that you receive, since you download them as part of the build. The build is run from a script that you must create. This article only covers the manual option. For more information on composing a build with Azure DevOps Services build tasks, see the Azure Pipelines documentation. 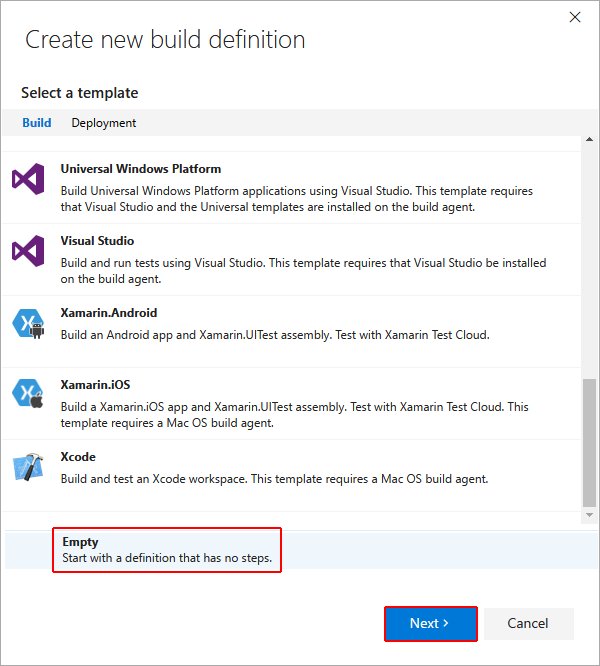 Start by creating a new build definition. Once you reach the screen that provides you an option to define what kind of a build you wish to create, select the Empty option. You're presented with the Task catalog. The catalog contains tasks that you use in the build. 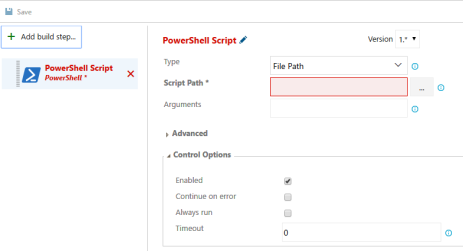 Since you have a script, select the Add button for PowerShell: Run a PowerShell script. Most of this document describes how to acquire the .NET Core tools and configure various CI services without providing information on how to orchestrate, or actually build, your code with .NET Core. The choices on how to structure the build process depend on many factors that can't be covered in a general way here. For more information on orchestrating your builds with each technology, explore the resources and samples provided in the documentation sets of Travis CI, AppVeyor, and Azure Pipelines. Two general approaches that you take in structuring the build process for .NET Core code using the .NET Core tools are using MSBuild directly or using the .NET Core command-line commands. Which approach you should take is determined by your comfort level with the approaches and trade-offs in complexity. 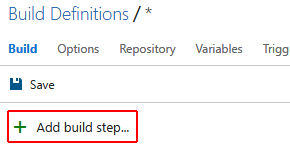 MSBuild provides you the ability to express your build process as tasks and targets, but it comes with the added complexity of learning MSBuild project file syntax. Using the .NET Core command-line tools is perhaps simpler, but it requires you to write orchestration logic in a scripting language like bash or PowerShell.